PERUGIA Etruscan walls of Perugia. Roots of Stone is an association created specifically to promote and guide the themes of conservation, restoration, enhancement of gates and walls of the redevelopment of areas pertaining to the walled cities. The intent is to bring back to good use, and high symbolism of renewed urban presence a primary monument that has always been the most intimate identity of every urban center in historic value .. The goal, ultimately, is that through this carefully, you can more easily drive the whole process of integrated conservation of heritage monuments and historic city centers. The full text of the objectives in the present Articles of Association is published in M. Libra, The Wall hidden, exploring the ancient walls of the city of Perugia, 2005 .. 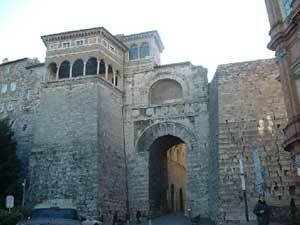 It is the responsibility of the Association, among many other things, to create, with its center studies, including the basis for the collection, cataloging, information management and exchange of all data will be collected on the city walls city ​​of Perugia and with it the city that have had reason to meet. A center for collecting and processing data, but, above all, an instrument capable of moving all of disclosure to the issue of safeguarding the values ​​expressed by the monument. The primary intent, however, is to give visibility, centrality and role in the monument walls at large, going in search of his closest value of formative and identification of every walled city, and therefore of civilization that its history and its people have been able to express. Form and content, in essence, united in an incomparable element synthesis. To achieve this, the indispensable minimum target is to search for a new, more modern, holistic reading of the walls of the track. In essence, through the riannodarsi, physical or virtual, that the history of the wires broke, isolated or subtracted from this track, you believe you can return to operation and compliance with the richest and most genuine form of urban identity of each center. This ends up transformed itself into a sort of real path of the Walls, called to renew those wires, to reappropriate spaces, views, architecture and urban fabric of buildings and often abandoned or unable to talk, as before, together .